Football Federation American Samoa (FFAS) is poised to host the Oceania Football Confederation (OFC) tournament that will give smaller Pacific nations an opportunity to qualify for the O-League, which has traditionally included only the heavyweights of Oceania. The Tupapa Maraerenga outfit is coached by Delaney Yaqona who has been with the team for many years as a player and has taken the lead role in preparing the team not only for the 2013 season but for the O-League Club Preliminary. “Our main focus for the last four weeks has been on our fitness durability which is crucial for the duration of the O-League tournament,” says Yaqona. “The players are aware that this tournament is going to be stringent and we will concentrate on taking one game at a time,” he says. 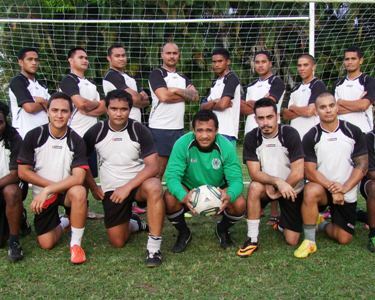 Tupapa Maraerenga will go head to head against the top clubs from Tonga, Samoa and American Samoa during the O-League Preliminary Tournament in September. Last year’s tournament saw Tonga’s Lotoha’apai United host Pago Youth of American Samoa, Tupapa Maraerenga of Cook Islands and Samoan club Kiwi in a round-robin competition from May 1 to 5 before the play-off against Mont-Dore on May 8. The two previous editions of the OFC Champions League Preliminary competition saw Vanuatu champions Tafea FC qualify for the competition proper in 2007-08, while AS Mont Dore of New Caledonia won last season’s tournament in a play-off with a 3-1 victory over Tupapa Maraerenga to advance to the group stages. No team from American Samoa, Cook Islands, Tonga or Samoa has qualified for the latter stages of the OFC Champions League since 2001 when Tonga’s Lotoa’hapai, Samoa’s Titavi FC, Cook Islands Tupapa Maraerenga and PanSa of American Samoa participated in the OFC Club Championship in Port Moresby in 2001. The winner of the round-robin tournament qualifies for the OFC Champions League group stage scheduled for Fiji in April 2014.